We know that undergoing a home project of larger scale and especially for the first time can come with an abundance of questions or concerns, so we have tried to outline some of the most common inquiries involving new screen enclosure installations, repairs, and maintenance below. If you wish to either hear a little more in detail answers or have a curiosity about something not listed, feel free to give us a call and we can happily work through it with you. What screen type should I use? Screen types are typically measured in squares per square inch, essentially how many tiny openings in an inch by inch area. The most common being 18x14 mesh size, as it keeps out almost all insects while still allowing for good visibility and breeze. However if you live in a coastal marsh area with extremely small bugs which are almost invisible to the naked eye, we would recommend looking into something more dense like 20x20. Denser screens can also be a good choice for preventing tree debris from getting caught like pine needles or leave stems. These are just the basics and you will find there are many more specific options in screens types so feel free to reach out if you would like to find the perfect one for your needs. Will pets damage my screen? Many home owners with enclosures also have pets, which is why several great solutions have been engineered to account for their sometimes rough play and sharp claws. Special screens which can be made up to seven times stronger and thicker than a traditional screen are often used on the lower third of the enclosure adding a protective perimeter for both animals within it as well as on the outside. 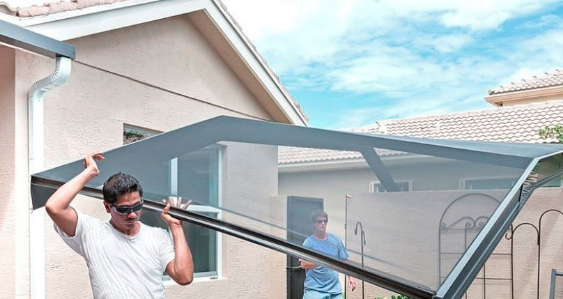 Will hurricanes damage my pool enclosure? While natural events have proven to be unpredictable and often devastating, we have come a long way in the enclosure industry, and every new installation meets or exceeds Florida's new building codes created with specific hurricane durability in mind. We can confidently say that it will share similar integrity to that of your home, which is to say if your house can weather the storm you wont have to worry about the enclosure. How will a screen room effect the value of my home? Our screen enclosures are basically always great for increasing a home's value. By installing one you are very cost effectively multiplying the square footage of your home, ad well as creating more usability. In our experience homes with attached screen rooms are viewed extremely positively in the marketplace and are used as great selling points. Will an enclosure look good with my home? The great thing about screen installations is that the very nature of their structure is not only light and elegant, but also highly customizable. With many various cage forms to choose from including Mansard, Hip, Gable, and Flat, along with our selection of screen types, frame colors, and lighting or other fixtures, you will find that we can come up with something to compliment any home. On top of this we will help you to visualize all of the options before construction begins with photos as well as computer generated models so that you can confidently make a great aesthetic decision. When starting a new enclosure project, it is best to start with a great foundation, which typically cement. However the needs are not nearly as strict as those found in your home foundation, so it will be more simple and cost effective. That being said we will do everything to make sure that all work is in accordance with your local building codes. Every project comes with a great variance of complexity and special customization, but in general the initial design and review phases could be completed in one to two weeks of time, while the actual on site installation can be done in as quick as a single day, spanning to three days for larger structures.